Gather round, children, this is one of my favorite stories in #TCTheater. Not that long ago, in a land not too far away, a couple moved home to Minnesota from NYC to start a theater company. Shortly after doing so, the rights to the holiday* show they were planning were pulled a few weeks before rehearsal was set to begin. Luckily, one of them was a playwright, so she wrote a play. 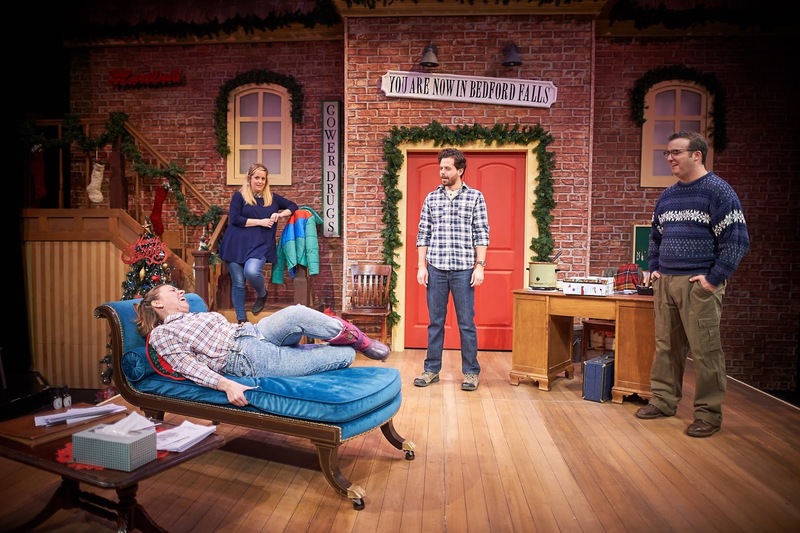 That play was a comedy about a couple that moved to a small town in Minnesota from NYC to run a theater company, when the rights to their holiday play were pulled the night before opening. They say write what you know, and Jessica Lind Peterson did just that, to great success. She mixed her and Yellow Tree Theatre co-founder Jason Peterson's story together with Minnesota humor, soap operas, Little House on the Prairie, a handful of quirky characters, and a bearded dragon, put it all in a crock pot to simmer, and something delicious was born. Now, ten years later, Yellow Tree's holiday show is a huge hit every year and anchors their season to be able to produce some extraordinary and diverse work year-round. 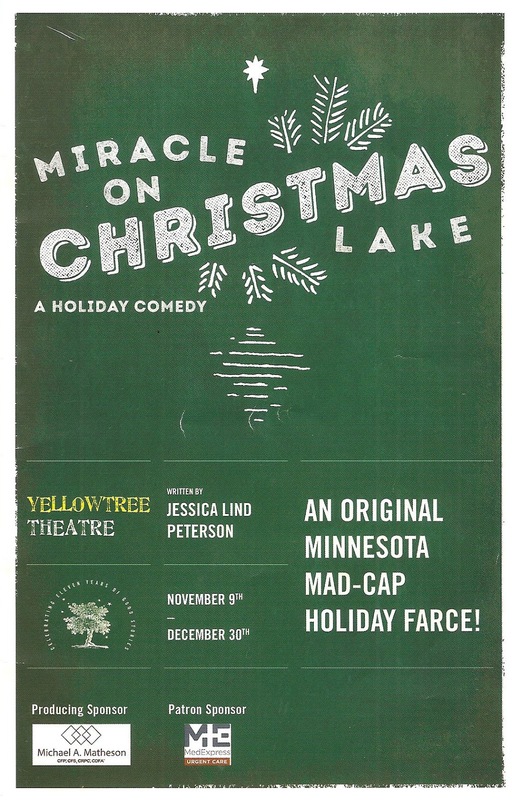 There have been two installments of Miracle on Christmas Lake, as well as two stand-alone plays A Hunting Shack Christmas (which you can see this December at Camp Bar produced by Actors Theater of Minnesota) and A Gone Fishin' Christmas. For their 11th season they're returning to where it all began, the original Miracle on Christmas Lake with most of the original cast. This was my 6th time seeing some iteration of the Christmas Lake franchise, and I love the silly, ridiculous, sweet, wonderful mess even more each time I see it. The show continues through the end of December, but as I mentioned it's always hugely popular, so get your tickets soon! 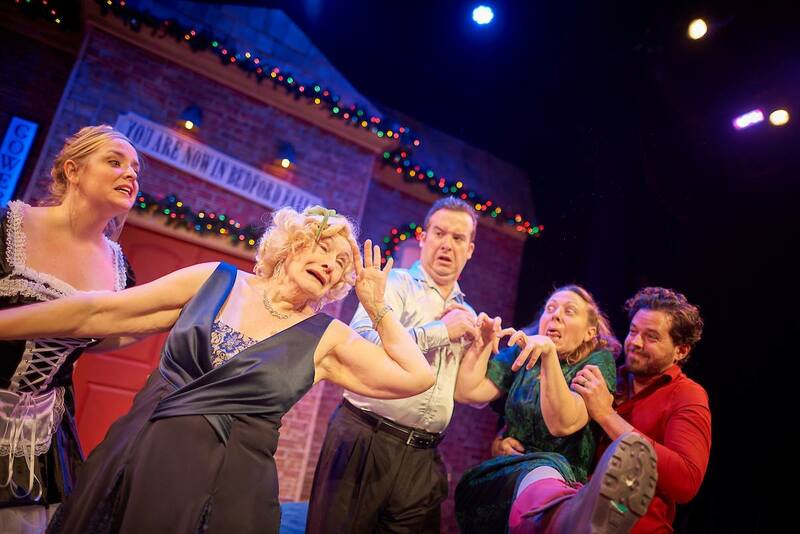 This is a laugh-a-minute kind of show, both in the jokes (at the expense of everything Minnesotan, soap operas, and Little House) and in the physical humor of this marvelous cast. Four of the five original cast members return for this incarnation, plus a couple of alternates who rotate in when needed because they need to do so many shows to meet the audience demand. 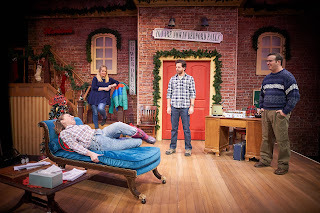 Jason Peterson, who also directs, is Colin, and Mary Fox is Tess, who are the "normal" ones among the wackiness of the Christmas Lake community. Namely, Jessie Rae Rayle's outrageous portrayal of Martha, just being as ridiculous as she can be, in the best way. Other actors have come and gone over the years, but the only Neil I've seen at Yellow Tree is Ryan Nelson, and I wouldn't have it any other way, with his hilarious impressions of everyone from Jimmy Stewart to Pa Ingalls. These two really are comedy gold, but it's almost as fun watching Jason and Mary watch Jessie and Ryan, as they somehow stay in their characters' honest reactions to the lunacy they're witnessing. Rounding out the cast is Miriam Monasch as both Colin's mom and Mrs. Burlington, which you would never know if you hadn't read the program. It's amazing how she completely transforms into both characters and makes them look, sound, and act completely different. Ten years later and I can only imagine how much this quickly thrown together play, along with the actors' performances in these now familiar roles, have been refined and perfected to the point where it's so smooth and such a joy to witness. The set (designed by Katie Phillips) looks a little different this year, perhaps larger, with steps going off to the side. It still has that small town theater charm, decorated for the cancelled production of It's A Wonderful Life, with festive twinkly lights (designed by Courtney Schmitz). The costumes go from casual chic (Tess and Colin) to the worst and funniest stereotypes of Minneosta (Martha and Neil) to the outrageous costumes for the play-within-a-play (all designed by Samantha From Haddow). And I must mention how much I love the eclectic holiday soundtrack played before the show, at intermission, and during scene changes (sound design by Joshua Stallings). 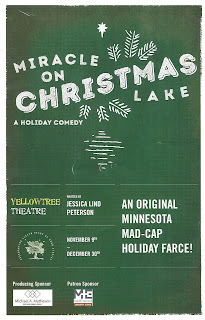 In many ways, Miracle on Christmas Lake is the origin story of Yellow Tree Theatre, and it's pretty remarkable to witness what this hastily written little play, and this theater in a strip mall in the suburbs, have turned into with a little bit of luck, hard work, talent, and a whole lot of heart. Make your way to charming downtown Osseo (it's really not that far away) to join in this delightful holiday tradition. And then come back next year for a brand new original musical (my favorite thing) Flowers for the Room, written by Jessica with frequent Yellow Tree collaborator Blake Thomas (the only flaw in this play is that it doesn't include a Blake Thomas original like the others do), and a new comedy Cry It Out. Who knew Osseo would become a destination for #TCTheater?! **Plot summary borrowed from what I wrote about the 2013 production at Yellow Tree.